Girls Trip is the fusion of a raunchy vacation comedy and a female-bonding melodrama. Unfortunately, the jokes stop being funny about 30 minutes before the end credits roll and the character-based elements are never better than overly familiar. The core problem with Girls Trip is its length. What might be a fun, frivolous affair at 90 minutes turns into an endurance contest as the clock ticks toward the two-hour mark. The movie outstays its welcome, forcing us to stay in our seats while pointless subplots are resolved on the road to an ending that tries to be all things to all people. This isn’t unusual for Malcolm D. Lee – both The Best Man and The Best Man Holiday had similar lengths and narrative trajectories – but he usually does a better job of not losing the audience too early. If the story sounds familiar, that’s probably because it is. 25 years after their glorious days of college sisterhood, four best friends are re-united on a trip to New Orleans. Ryan (Regina Hall) is the star of the group. Having married ex-NFL standout Stewart (Mike Colter) and founded her own self-help brand, Ryan is on her way to becoming the next Oprah and has been invited to be the keynote speaker at the annual Essence Magazine conference. Her once-inseparable pal, Sasha (Queen Latifah), with whom she had a falling-out, is now the editor of a struggling celebrity gossip website. Dina (Tiffany Haddish) is just as sexually voracious and uninhibited as ever. And Lisa (Jada Pinkett Smith) is nervous about leaving her two children and has forgotten how to let down her hair. Over the course of their stay in New Orleans, they renew their friendship, revisit old rivalries, and rekindle old romances. Girls Trip was made with a specific demographic in mind and is being released as a form of counterprogramming to the more traditional summer fare. The Pollyanna ending marks this as fantasy/wish fulfillment but, even as fluff, its strict adherence to the happy ending/no consequences resolution is disappointing. To put it bluntly, the ending is a total cop-out and, by the time it arrives, the movie has lost its sense of humor. There’s nothing snarky or irreverent – it wallows in an artificial sincerity that curdles. 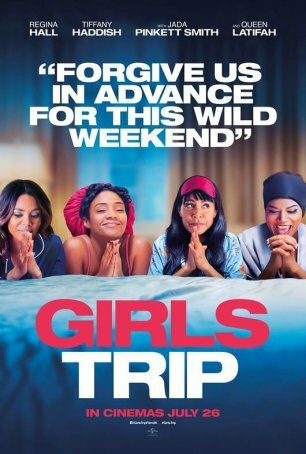 At one point, it appears that Girls Trip is ready to satirize the self-help industry and the branding that accompanies it but the screenplay inexplicably doesn’t follow through. It’s as if it’s willing to poke a little fun at all the Oprah wannabes but is afraid of actually insulting anyone. In fact, gross-out humor aside, Girls Trip is surprisingly toothless. Crudeness doesn’t equate to edginess. The movie has plenty of the former but none of the latter. The four main leads are effective. Tiffany Haddish gets the award for “Class Clown” – she is consistently given the funniest material and, as a result, is the most profane and vulgar. The other three are likable and get a more conventional mix of humor and low-key drama. None of the men have significant roles (nor would one expect them to). Mike Colter plays a handsome cad while Larenz Tate is the longtime friend who allows Ryan to taste true love. My sense is that the target demographic for Girls Trip may be satisfied by the film, in part because there are so few wide releases available with a cast that is predominantly black and female. Girls Trip is safe and predictable in every way imaginable – even its naughtiness is mandated by the genre. Some will find comfort in this bland familiarity but I found it to be a slog to sit through, especially toward the back end of the bloated running length once the limited spontaneity of the jokes had been exhausted. The movie has its pleasures but not enough of them to make it worth the heavy time investment.